North Star Foundation was incorporated at a nonprofit organization in the year 2000 and since this time has created over 275 assistance dog partnerships with children who face challenges around the world. Our clients are children whose challenges range from autism to serious medical conditions to grief over the loss of a parent. All the children we serve have family members who are similarly affected and whose needs have also been factored into our services. Traditionally, assistance dogs were for adults and highly trained to mitigate a specific physical disability (i.e., seeing eye or wheel-chair work), with very little preliminary or follow up contact for the client or their family. At North Star, we're focused on meeting our children's social, emotional or educational challenges with the help of a well bred and carefully socialized North Star dog and we take a team approach that ranges from family to school to larger community. Creating a service dog placement for a child with autism differs from creating placements between service dogs and physically challenged adults. From puppy hood on, the philosophy of training the dog and the timetable for placement has to be tailored to the unique needs of the child and move in tandem with the dog's natural development. We put considerable energy into teaching the child to interact with the dog in ways that enhance bonding. Because the quality of the relationship matters more than any other variable, it is essential that early interactions are supervised, more so than might be necessary for an adult with mobility problems. Supervision is essential to creating a placement that is safe and effective. The early pairing of puppy and child has risks. What if the temperament of the puppy does not unfold in the way we envisioned? What if the child does not "take to" the dog? The same difficulties with communication that children with autism experience with people can exist with dogs. Dogs take their cues from humans regarding how relationships are structured; training is just a concentrated form of communication about what behaviors we want to encourage or discourage. If a child with autism does not make it clear to his/her puppy that playful nips hurt, then the puppy will naturally nip more. It is important for the caretakers of any child to understand that their role is to ensure that the relationship between child and puppy is consistently gentle and mutually enjoyable. I often refer applicants to Canine Companions for Independence (CCI) (www.caninecompanions.org) and other traditional programs for families that are not right for North Star's unique philosophy of placement. Although there are clear drawbacks to bypassing puppy hood and placing a child with autism with an older dog instead, some families need the certainty of a thoroughly trained adult dog. Sometimes children have visual, hearing or mobility impairments and need a dog with a high level of intensive and task-specific training. However, dogs in traditional programs are in training for a longer period of time and the kenneling and training not only drive up the cost of the placement, it also makes future bonding more difficult. Delayed placement has the potential to influence success of bonding between the child and the dog because by the age of two years, a dog's temperament and abilities are well established. What if the dog has not had exposure during the early months to the child in question, or the specific challenges they present? With no experience in how to interpret autistic behaviors, the dog may react unpredictably. Children with autism or other developmental disabilities often display unusual behavior-sometimes they throw loud tantrums or fail to grant the appropriate body space that we unconsciously and consistently grant each other. Dogs depend greatly on nonverbal communication, and are apt to be uncomfortable with violation of "personal space." For example, a number of years ago, we received a two-year-old Golden Retriever, Madison, from CCI, to help our son with autism. I decided to take Madison to a rehabilitation center for a pet therapy visit. A woman with Alzheimer's disease approached, waving her arms and speaking loudly in gibberish; Madison growled menacingly and we retreated hastily. Here was a dog that had a very gentle temperament and was extremely well-trained, but he lacked exposure to the profile of a typical Alzheimer's patient and interpreted her behavior as threatening. It occurred to me that ideally a dog should be raised from puppy hood with exposure to his/her eventual partner or at least with exposure to the typical behavior patterns of this future partner. Madison came to us equipped with the skills of a working mobility assist dog, and although his temperament proved exactly what we needed to help our son, many of Madison's skills were useless to us. Although Madison formed a bond with my son Danny and the rest of us, right from the start his canine heart clearly belonged to my husband, Ron. The puppy-raiser who cared for him during his first eighteen months of life was a middle-aged gentleman with no family. The powerful and early bond which formed between the two provided the template for Madison's future relationships, and now when Ron leaves on his occasional business trips our entire family must support Madison emotionally. Ideally, this is the type of deep bond a service dog should form with his child partner, not the father of the child. I now believe the earlier the working pair bond, the greater the chance for achieving a deep relationship. It is out of these convictions that North Star Foundation was formed and I set out to breed, socialize, and train service dogs for children in nontraditional ways. Careful breeding and educated puppy selection go a long way toward reducing training time and increasing safety, as does establishing optimal behavioral patterns right from the start. Interestingly, there are desired qualities in a North Star dog that cannot be trained; they instead are recognized, carefully nurtured, and supported. A concept Guiding Eyes for the Blind refers to as "intelligent disobedience" is valued in any service dog for both adults and children. If a blind person approached an open manhole, it is desirable that the dog ignore the command to "Go forward" and instead lie down in front of his/her partner. This quality of understanding needed to interpret their environment and protect his or her partner is largely found in the dog's genes, but equally high emphasis must be placed on early nurturing and training of the puppies. It is the interplay between nature and nurture that matters the most and this is not a static process. A North Star dog's job description is created and refined in the many interactions between dog and child and family. We approach a North Star puppy's education very seriously during its first six months of life; we then transfer this to the families of our clients, who become partners in training the dog to meet their child's specific needs. North Star staff remains available for support, with frequent visits, telephone calls, and e-mail. Families are asked to enroll in a training class that emphasizes positive reinforcement techniques to deal with the adolescent dog's desire to push the limits he or she has previously accepted with good-natured puppy charm. One of the first puppies we placed at North Star (named, appropriately enough, Star) went to two brothers on the autism spectrum. The younger brother, David, was a wanderer. This was alarming, as this family lived on the edge of dozens of acres of woods. In creating this placement we incorporated games such as hide and seek into this puppy's training in preparation for the day that Star's search and rescue skills might need to be tapped. So far, this has not happened, but twice Star has alerted the family to David's wanderings by barking frantically and circling him. We did not train this dog to do this; I believe by growing up with David and his family, Star learned the importance of keeping David within sight. Surprising benefits accrue and dovetail when a service dog grows up in his or her permanent home, with access to the particular child's needs. All of North Star's placements are family-based, with every member given a special job to perform with their North Star dog. The job assignments are created with bonding issues uppermost in mind. For example, to facilitate bonding, jobs such as feeding will be given to the child with a challenge, but we also try to draw the rest of the siblings into the placement with jobs such as walking or grooming. The Golden Retrievers we use at North Star are from a genetic line known for its sociability within a breed known for its social nature, and they are determined to form individual bonds with every member of their immediate family. These effects are heightened in a child with autism because of the powerful nature of communication between the dog and the child. The nonverbal avenue of interacting with a dog is an important advantage here, as sometimes spoken language can get in the way of successfully communicating with an autistic child. 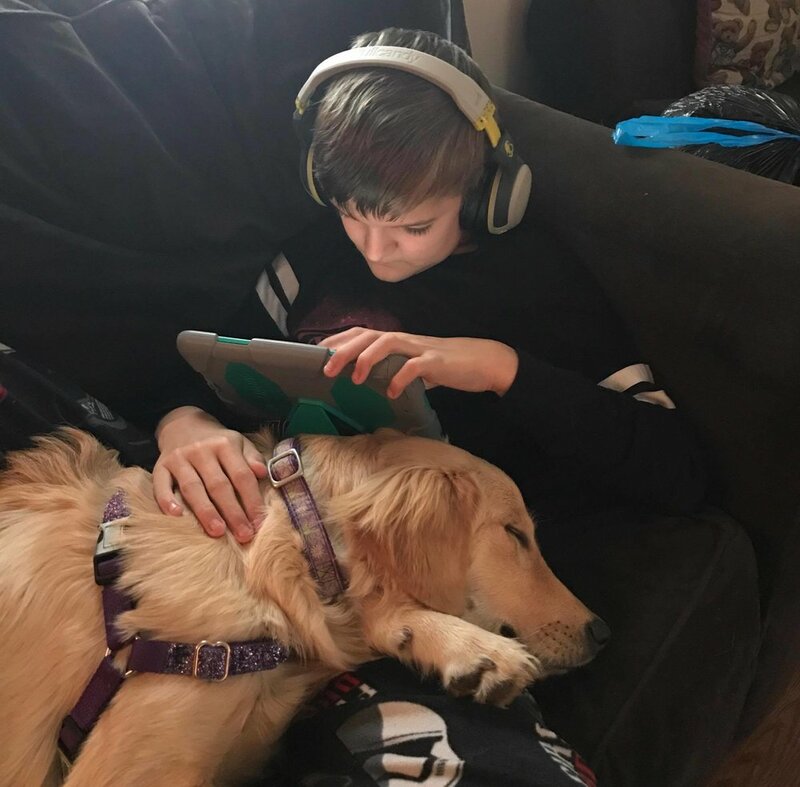 For a child with autism who has had an exhausting day struggling to communicate in a manner that is foreign to him, spending time with his dog is a nice way to structure critical down time, which can greatly reduce the frequencies of meltdowns. The concept of "time out" with a service dog reliably holding a down-stay to provide comfort and support can be seen as a positive way that a child can have the rough edges of his or her day smoothed over. As children with autism tend to be dependent on verbal cues provided by others, this positive and predictable social response is a valuable tool to help with speech within natural settings in the home as well as the outside community. People who may have shied away from the responsibility of starting a conversation with your child, as well as keeping it in motion, often relax and rise to the challenge when a dog is available to help structure the questions and comments. To date, approximately half of our placements have been to children with autism. Early intervention is crucial for children on the spectrum to have them reach their optimal development, and recent research highlights the importance of incidental teaching, rich learning environments and relationship based treatment plans that our dogs can be a part of; Incorporating the parents, siblings and larger community into the treatment plans of the children we serve has a positive impact on the child with autism's ability to become mainstreamed into their schools as well as neighborhoods. Challenges such as autism presents can be seen most clearly in the context of social relationships; as such, part of the value of a North Star dog relates to the surrounding community, including that of the child’s neighborhood and school. Our services include educational programs that can be presented to the child’s classmates to enlighten about the specific challenge faced. Our dogs are part of these presentations, dressed in a North Star cape and ready to be a well trained ambassador for their child. We believe there is no better way to teach tolerance than through the eyes of a puppy being trained to help a child find their way to a happy and healthy tomorrow. Keeping everyone's needs in balance, we focus on mitigating the effects of the child's challenge through the use of a North Star dog as a tool to achieve this result. Together, we work towards defining the role, socialization and training of every dog we place. Much of the actual fine tuning of the training occurs upon placement after foundational behaviors have been firmly established, as the role of the North Star dog is in great part created by the developing bond. The ongoing support, guidance, training and affiliation helps to make our placements stable over the dog's entire lifespan. It is with great pride that we follow our North Star dogs' progress as they settle into well established routines that best assist their child in maximizing his or her potential. We also provide educational materials (books and videos), public speaking, and consulting for anyone interested in learning more about the role a well bred and well trained dog can provide for children who face social, emotional or educational challenges. North Star Foundation is 100% supported by donations through this website and by its loyal patrons.